This was a fantastic weekend! We learned so much so quickly but at the same time could take it at our own individual pace. When I got into the kayak on the first morning I was still a little uncertain about trying out whitewater but by the end of the weekend I felt very comfortable. I was definitely glad I went. Thank you Kelly and Dave! Fantastic! The instruction was top notch. The instructors' attention to detail and focus on safety were superb. The classroom environment was interesting, the class time on the water was a blast, and the attendees had a great time together during and after class around the camp fire. 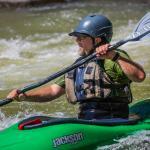 I highly recommend this course to anyone interested in kayaking in New Mexico. This was my second time in this class in a months' time. Although I enjoyed the first class, I felt like all the pieces began to fall in to place the second time around. I felt my skills improved exponentially. The instructors were very skilled and helpful in zeroing in on specific needs of those in the class, and were there to roll you (back up) when necessary. Loved it. I have to say, Kelly covered EVERYTHING! I've taken this weekend class twice to absorb everything that goes into whitewater kayaking. Since my class, I've paddled on class III whitewater and felt like I had a great sense of what [maneuvers, compound strokes or techniques] to do, when to do it, how to do it, and why to do it! What Kelly teaches would be pretty much impossible for a self-taught paddler to figure out alone. I feel safer, and more confident each time I'm on the river with a foundation of strokes and concepts to practice outside of class, and most importantly, I feel in control on the water. The class that I attended was small but the level of experience was quite varied. Kelly has a great sense where the students skills were at during the weekend. Kelly had a sense when a student needed to re-group after a bit of trouble and when he could push them with new skills to build their confidence. Overall the group proceeded very smoothly through the weekend course without interuption.